What are background legal principles governing coastal land ownership and access rights? More on eminent domain and takings. Who owns the shore in Maine? More on land ownership and trusts. How is Working Waterfront legally defined? What State and Federal statutes are relevant to access issues? 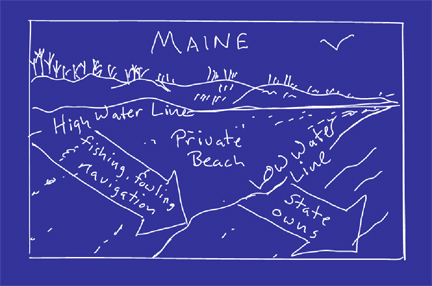 Maine is one of only a few states (DE, MA, ME, NH, PA, VA) in which coastal property owners own land out to the mean low tide line as accomplished by the Colonial Ordinance of 1641-47. These ownership interests are subject to a centuries-old public easement for "fishing, fowling and navigation," however. In most other coastal states this intertidal land is owned by the state in trust for the public under the public trust doctrine. The right to own property and exclude others from it is a fundamental feature of U.S. law. Under Maine common law, coastal property owners may prevent people from gaining access to the shoreline of their land. Gaining unauthorized access – either perpendicularly or horizontally to the shore – may be trespassing for which one may be liable in court. The government has authority under its police powers to make laws protecting the welfare of its citizens, including regulating lands next to beaches and shores. Under the public trust doctrine, the government is obliged to act on behalf of the public to protect publicly-owned submerged lands below the mean low tide line, and publicly owned natural resources such as fish, shellfish, and seaweed that might be harvested from the shore. The U.S. Constitution and many state constitutions also give the government the right to take private property under the power of eminent domain but only if the landowner receives appropriate compensation. Sometimes the government’s attempts merely to regulate behavior on or use of land goes so far as to amount to a "taking" requiring the government to pay the landowner for the lost value of the land. Maine is one of only a few states in which coastal property owners can own land out to the mean low tide line. These ownership interests are subject to a centuries-old public easement allowing the public to use the intertidal zone for the limited purposes of "fishing, fowling and navigation." At present, this does not legally include public use for recreational purposes. 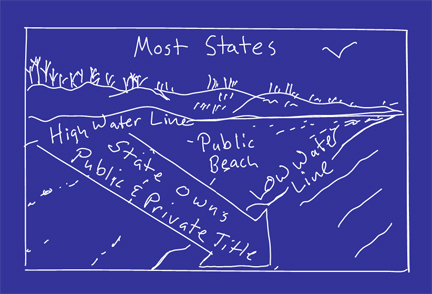 In most other coastal states the intertidal land is owned by the state in trust for the public under the public trust doctrine. This generally entitles the public to use the intertidal zone for recreational purposes as well as such things as fishing and navigation. Ever since the Coastal Zone Management Act of 1972 first suggested that states prioritize planning to protect water-dependent uses, consensus as to exactly which waterfront uses ought to be protected has eluded federal, state and local authorities. Many authorities recognize, often without agreement on the finer points, that the concept of working waterfronts encompasses uses that are water-dependent, water-related, water-enhanced, and non-water-dependent. Whether captured in constitution, statute or agency guideline, these definitions range from a narrow fisheries-only categorization to more open-ended definitions that include boatyards, marinas, and even resort hotels. Indeed, members of Congress from the same state can be found proposing different definitions of working waterfront, as can county officials within the same state. Setting aside the aim of uniformity, after a comprehensive survey of working waterfront definitions, researchers at the University of Florida Levin College of Law suggest that the most effective working waterfront definitions include the following: 1) a statement of purpose, 2) a locally or regionally tailored description of place, 3) examples of included and excluded uses, and 4) provisions addressing water-related and water-enhanced uses as well as water-dependent uses. In Maine, the Working Waterfront Covenant and Maine’s Current Use Taxation for Working Waterfront both provide legal definitions for working waterfronts. These definitions are crucial because they determine what qualifies for protection through tax incentives and/or funding opportunities. For detailed analysis of various working waterfront definitions, see Defining Working Waterfronts. Designed to prevent the conversion of waterfront land that is used for or supports commercial fishing activities. Owners of working waterfront property may apply to have their properties valued according to their current use as working waterfront. In exchange, the landowner must maintain the property for working waterfront uses only, or risk a financial penalty. The reduced valuation and associated tax reduction apply only to the land, not to any structures or equipment on the property. Defines "Working waterfront land" as a parcel or portion of a parcel of land abutting tidal waters or is located in the intertidal zone (located between the high and low water mark) the use of which is more than 50% related to providing access to or in support of the conduct of commercial fishing activities. Designed to prevent the conversion of open space land to more intensive uses as a result of economic pressure. Parcels enrolled as Open Space are assessed at current use with additional reductions possible for those parcels allowing public access.